Four of the seven members of the Williamston School Board face recall on November 6. A year ago, political fireworks lit up the small town of Williamston...and ever since, a long, slow fuse has been burning towards the ballot box. Last November, the school board approved a pair of transgender student policies. One was about restroom accommodations, the other about gender identity. The package passed on a 6-1 vote. Board president Greg Talberg says it was the right thing to do. “We have a policy in place that our administration and staff can respond thoughtfully and consistently,” says Talberg. Now, that vote could cost four incumbents their seats. Talberg and fellow board members Christopher Lewis, Nancy Deal and Sarah Belanger are facing a recall election. 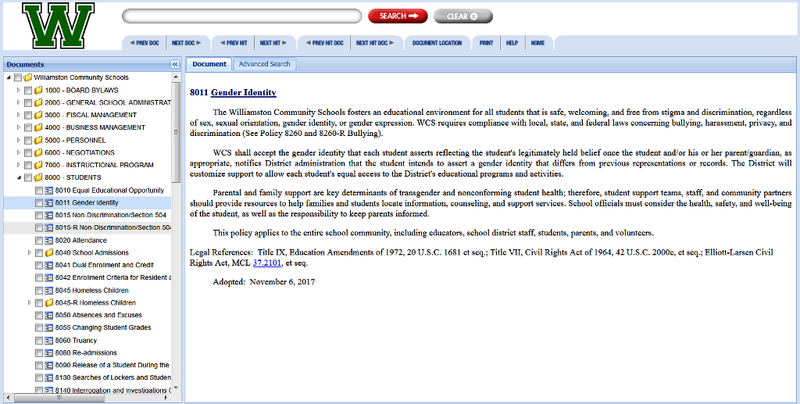 The Williamston Board of Education passed this gender identity policy on Nov. 6, 2017. “The ‘and / or’ piece...absolutely, parents should have concerns about that,” says Williamston parent Lori Johnecheck. Johnecheck says the policy gives schools the latitude to decide not to notify parents about their child’s chosen gender identity. That, she says, runs counter to Michigan statutes. “We’ve got a law that says the parents have the fundamental right to raise up their child and be in charge of their education,” Johnecheck asserts. Board supporters say there’s no usurpation going on in Williamston. Ellefson has a transgender son who formerly attended Williamston High School. She insists there are valid reasons for an “and / or” clause. Ellefson notes that an 18-year-old high school senior is a legal adult. In other cases, a student may be an emancipated minor. “Unfortunately, there are some families, who if their child came out as LGBTQ would beat them, emotionally abuse them or kick them out of the house,” says Ellefson. School board president Greg Talberg says the district is aware of that possibility. He says it was never the district’s intention to withhold information from parents. But Lori Johnecheck says this issue goes beyond parental rights. She questions why the school board ever felt it needed a separate policy just for transgender students. Johnecheck says all students are protected under Williamston’s 1997 equal education opportunity policy. She says the board was wrong to affirm any specific group of students...and, she says, it did so against popular will. Still, Nicole Ellefson defends the policy as a best practice. She believes the school board majority that voted for the transgender policies took a proactive step in the interest of every student. “So, to throw out these people who’ve done hard work, who’ve done massive learning about so many different things, who are dedicated members of our community, I think would be a huge mistake,” Ellefson says. As Election Day nears, a lawsuit filed against board members Talberg, Lewis, Deal and Belanger, as well as two former members, is pending in federal court. For now, though, board president Greg Talberg is focusing on campaigning. He says there’s other matters to attend to in the Williamston Community Schools. However, if Talberg and company should lose their seats, a recall will end their terms immediately. That question will be resolved on November 6...exactly one year to the day since Williamston passed its transgender policies.